Models Elsa Hosk, left, Kendall Jenner, Hailey Bieber and Joan Smalls pose together at the grand opening of The Times Square Edition hotel in New York. Model Kendall Jenner attends the grand opening of The Times Square Edition hotel in New York. Model Kendall Jenner wears a creation as part of the Versace women's Fall-Winter 2019-2020 collection, that was presented in Milan, Italy. 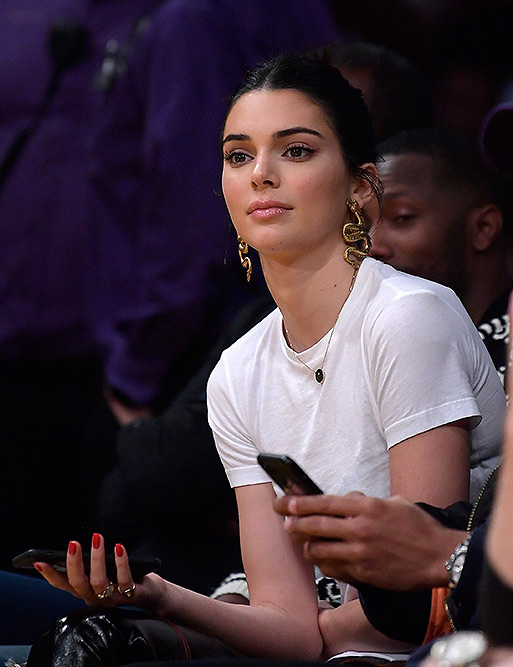 Kendall Jenner watches during the first half of an NBA basketball game between the Los Angeles Lakers and the Philadelphia 76ers in Los Angeles. Models Bella Hadid, left, and Kendall Jenner wear creations for the Off White Spring/Summer 2019 ready to wear fashion collection presented in Paris. Model Kendall Jenner wears a creation as part of the Moschino women's 2019 Spring-Summer collection, unveiled during the Fashion Week in Milan, Italy. Model Kendall Jenner poses for photographers upon arrival at the premiere of the film 'Girls of The Sun' at the 71st international film festival, Cannes, southern France. Model Kendall Jenner poses for photographers upon arrival at the Chopard Secret party during the 71st international film festival, Cannes, southern France. Reality TV personality and model Kendall Jenner slammed media outlets and the paparazzi for revealing her house's location in public.